March always means two things to me: daffodils and birthdays. Both my mum and brother have birthdays this month, only eight days apart, which means lots of celebration cake baking in a very short period of time. But I like that! A layer cake is one of the most fun recipes to create. 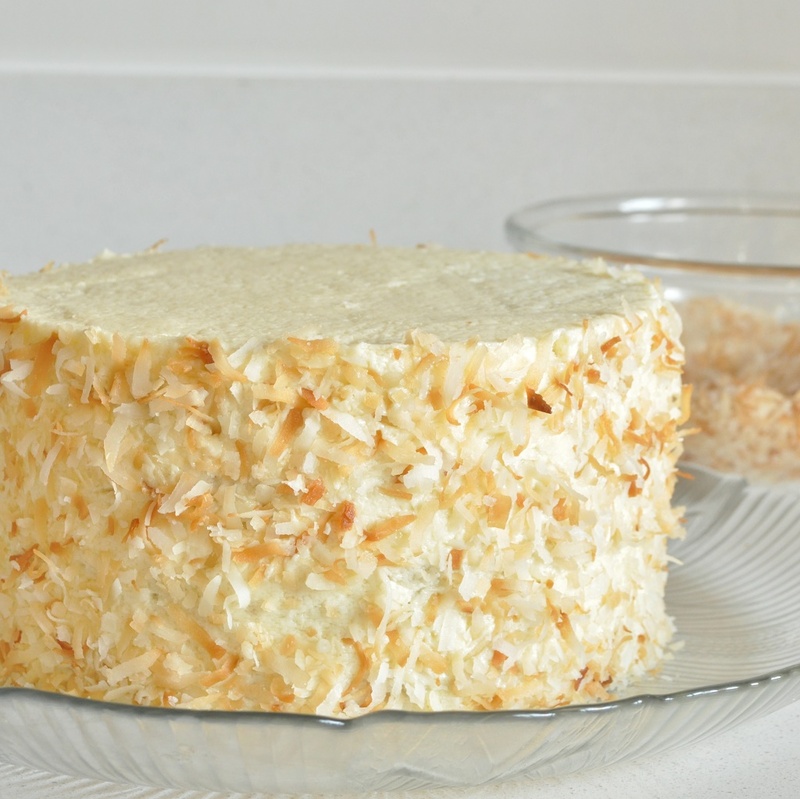 For my brother’s birthday this past weekend, I decided to make a coconut-white chocolate cake, as he is very fond of the white chocolate-coconut truffles that I frequently sell at my stall at our local markets. I needed an eggless cake though, because of my mother’s allergy. 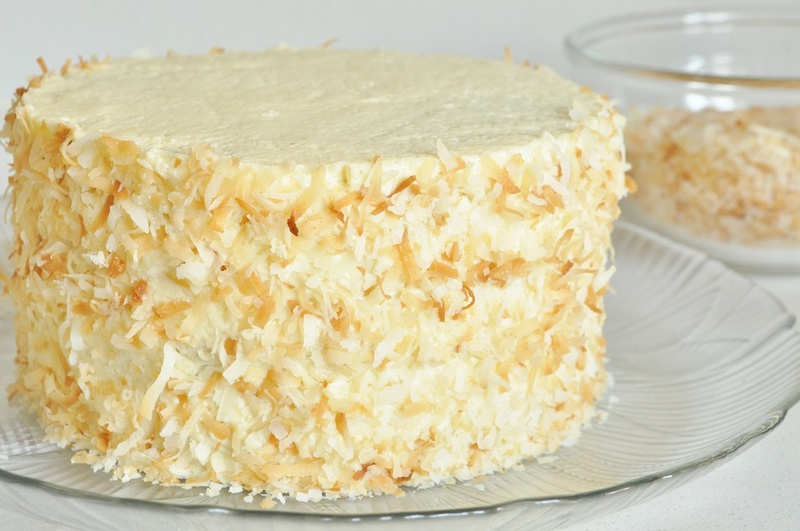 So I tinkered around with a recipe for a silver-white cake that I had used successfully in the past, working in coconut milk and toasted coconut. 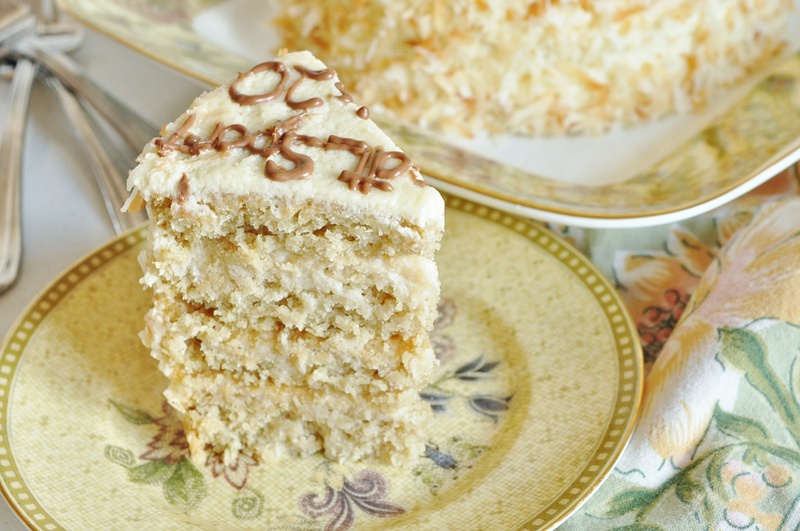 I wanted a cake that truly tasted of coconut on its own: I wasn’t going to just coat a vanilla cake with shredded coconut and call it “coconut cake.” Well, this one does have a good, strong coconut flavour, and is so lovely and moist. I made a white chocolate-coconut ganache to use as the filling, and I substituted coconut milk for the more usual cream in the ganache as well, in order to get in as much coconut as possible. For the frosting, I made a recipe I have long been wanting to try: boiled milk buttercream. I can’t ever use meringue buttercream for family birthday cakes, obviously; but that was the icing we always used at pastry school, and I have missed its delicate, silky texture. I am delighted to find that boiled milk buttercream has an almost identical flavour and mouthfeel! I don’t think I will be using any other buttercream for birthday cakes from now on. And then I actually did coat the assembled cake in toasted coconut—but that was only for looks, this cake didn’t need any help in the flavour department. It was a tremendous hit with everybody, and I absolutely loved developing the recipe and executing it. So happiness all around. You may not have any birthdays this month, but somehow I don’t think that should keep you from joining in. And if you need a more substantial reason to bake a layer cake than “I want to,” Easter is just around the corner . . . This cake is my submission to Choclette’s We Should Cocoa challenge, which is being hosted this month by Maison Cupcake. The theme is layer cakes. 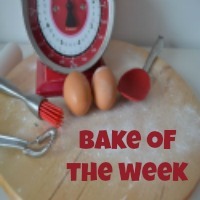 I am also linking up with Casa Costello’s Bake of the Week. Make the filling the night before. Preheat the oven to 175°C/350°F and spread the coconut out in an even layer on a baking sheet. Place in the oven and toast until gold and fragrant, 5 to 10 minutes, rotating the pan and stirring the coconut halfway through so that it colours evenly. Let cool. Place the white chocolate in a heatproof bowl, and pour the coconut milk into a small saucepan. 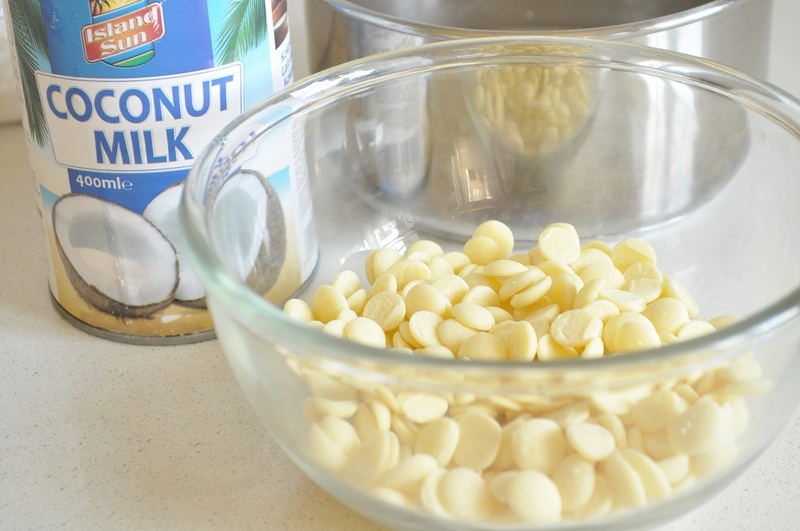 Bring the coconut milk to a simmer over medium heat and then pour it over the white chocolate. Let stand for 30 seconds before gently whisking the chocolate and coconut milk together to form a smooth ganache. Stir in the cooled toasted coconut, cover, and allow to set over night. To make the cake, line two 6-inch round pans with parchment paper and butter the sides of the pans. Preheat the oven to 190°C/375°F. Spread the dessicated coconut over a baking sheet and toast it in the oven, stirring frequently, until the coconut is fragrant and beginning to take on a little colour. It doesn’t need to be golden, this is just about releasing flavour. In a large bowl, whisk together the flour, golden caster sugar, baking powder, and baking soda. 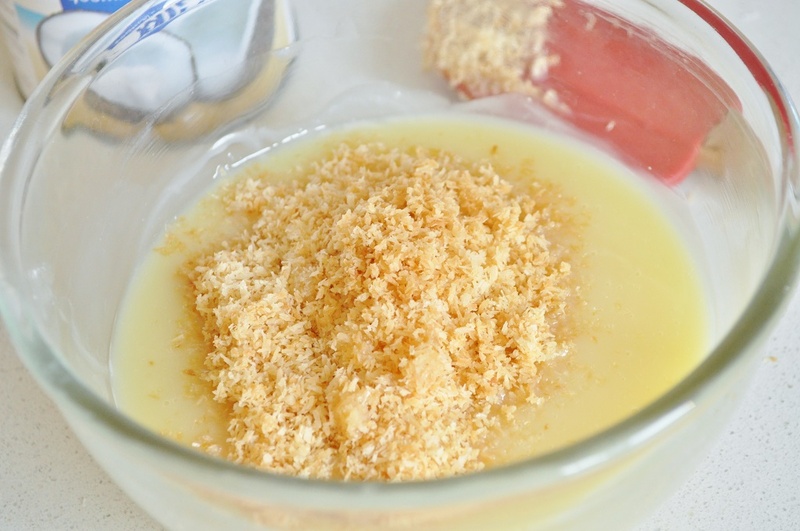 In a liquid measure or pitcher, combine the water, coconut milk, vinegar, vanilla extract, and melted butter. Pour the wet ingredients over the dry and stir to combine. Mix in the toasted coconut. Divide the cake batter evenly between the two pans and place in the oven. 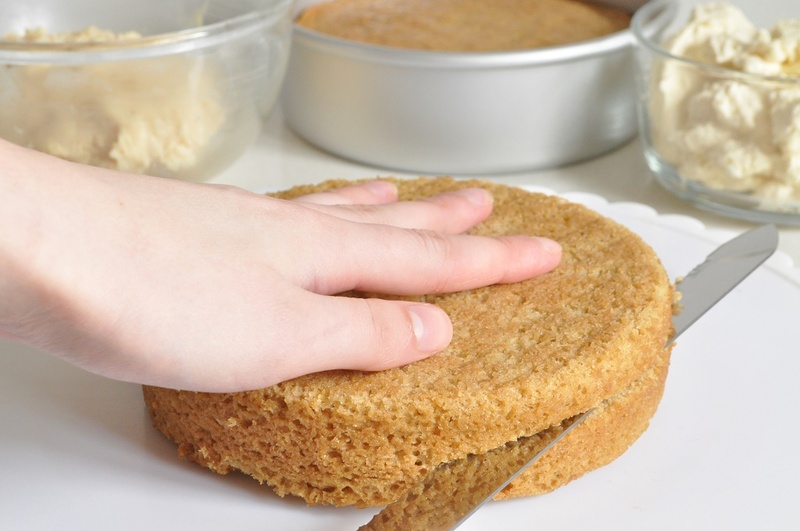 Bake until a toothpick inserted in the centre of the cake comes out clean, 25 to 30 minutes. Cool the layers in the pans for 10 minutes, and then turn out onto a wire rack to finish cooling. While the cakes are cooling, make the buttercream. In a small saucepan, whisk together 2 tablespoons of the milk and the flour, making sure to press out any lumps with a rubber spatula. Place over low heat and bring to a simmer, whisking constantly. Simmer for 30 seconds; then pour the boiled milk mixture into a bowl and cover with plastic wrap, pressing it directly onto the surface of the milk, in order to prevent a skin from forming. Let cool. Once the milk is cool, place the butter and caster sugar in the bowl of a stand mixer fitted with a paddle attachment and cream on medium-high speed for 5 minutes. Beat in the vanilla extract and the cooled milk mixture, and continue to mix on medium-high spead for another five minutes. The frosting should be very light and silky smooth. Now everything is ready to put together! 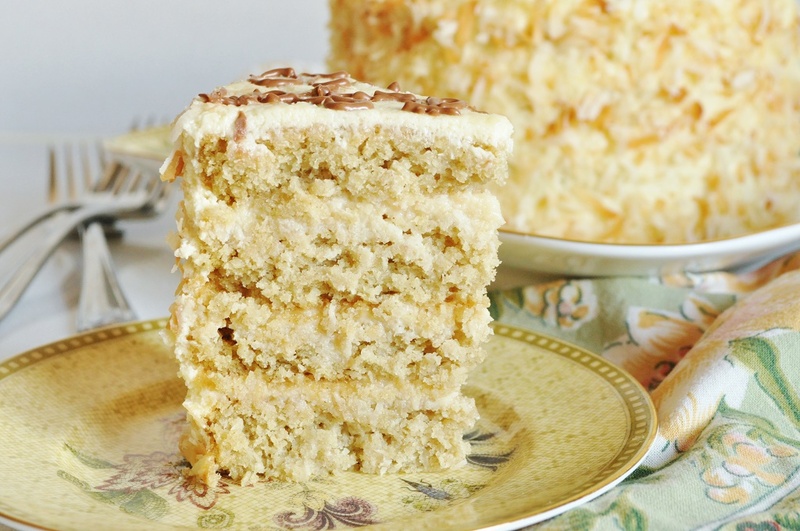 Using a long serrated knife, slice each cake into two even layers. Place one on a serving plate and spread one-third of the white chocolate-coconut ganache over it. Repeat the layering with two more of the layers, and then finish by placing the last cake layer on top. Press down lightly to secure. Brush any loose crumbs away from the top and sides of the cake and ice with the boiled-milk buttercream. 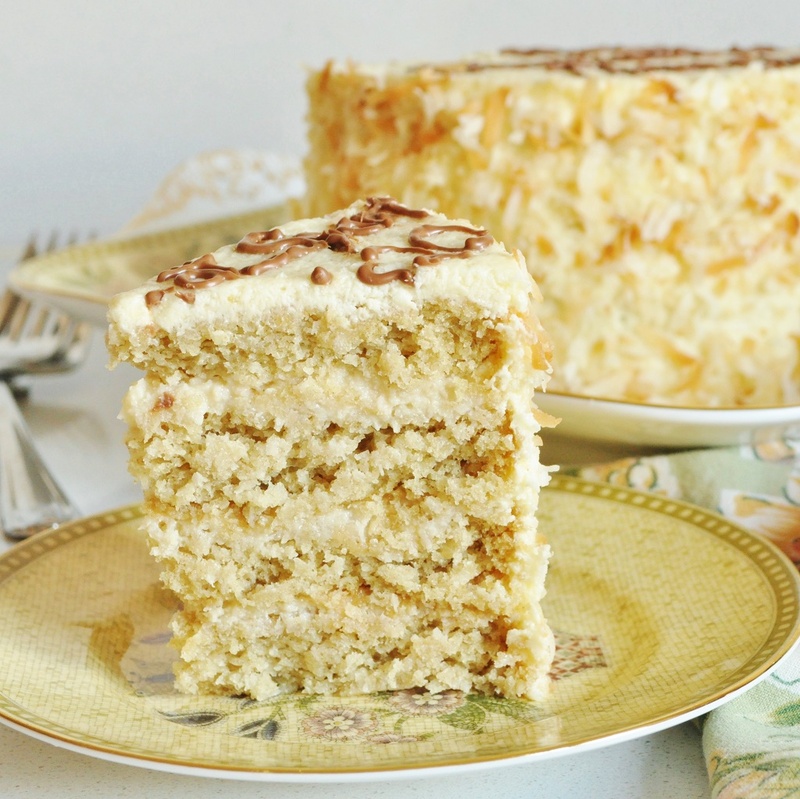 Coat the sides of the cake with toasted sweetened coconut, cut into slices, and serve. That looks divine! I adore coconut yet don’t think I’ve ever paired it with white chocolate for some reason. 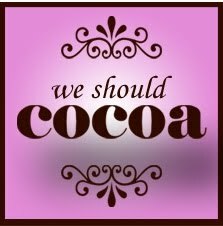 Thanks for submitting to We Should Cocoa! My pleasure: Layer cakes are always a favourite challenge with me! I highly recommend trying coconut and white chocolate together (and if you throw in some lemon as well, it’s even better . . . divine). Thank you, Kate. 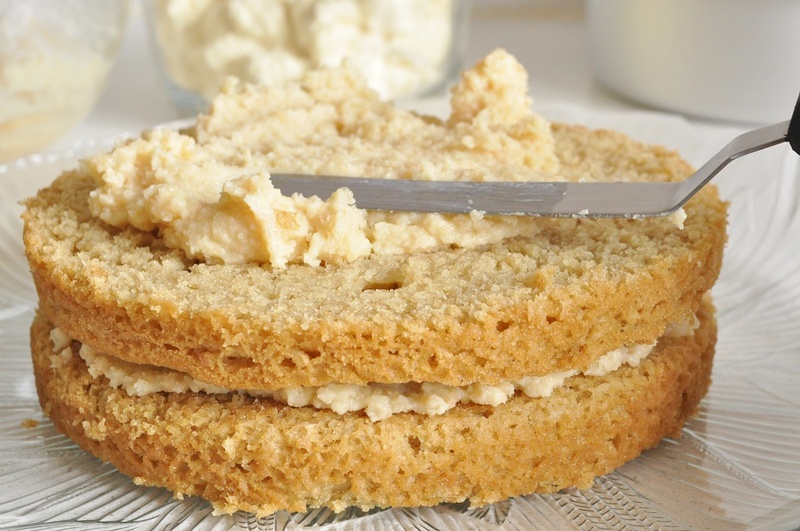 The boiled milk buttercream is delicious–so glad to have discovered it! This is simply wonderful, I can almost taste the flavours and textures – although I’d much rather do it in reality than in imagination. It looks beautiful too. I made a white chocolate and coconut layer cake a few years ago and it’s one of the ones that stands out in my memory it was so good. You’ve also reminded me about boiled milk buttercream, although I didn’t know that’s what it was called. I do remember it having a very smooth mouthfeel and you’ve inspired me to try it out once more. Thanks for joining in with We Should Cocoa. Thank you, Choclette. White chocolate and coconut is definitely a favourite of mine–I still remember how heartbroken I was when a bakery I used to go to as a kid discontinued their white chocolate-coconut-lemon cookies. I couldn’t believe it! This is one of my favorite cakes, I love it! It’s now one of my family’s favourites, too! That looks heavenly….yuummmmm!!! Great job! Is it possible to try this cake in a microwave oven? If yes then can you guide me about the important points I need to take care of while baking the cake? Also if I want to make this cake for just 2 to 3 people, what shall be the necessary changes in the quantities of the ingredients? This cake looks so tempting.. I can’t wait to try it at home.. I would be very glad if you could help me with my queries 🙂 Thank u! I’m afraid I have no experience making microwave cakes, so I really don’t know if this recipe might work with that method. To serve three people I would just do a half recipe of filling and cake, using one 6-inch pan, and then slice the cake layer in half horizontally and use the two halves as the layers. I wouldn’t halve the icing recipe though; it would be a bit too tricky, I feel.